Perhaps you have read about the researchers at the U of Illinois/Urbana-Champaign who have developed a quantum computer that can perform an operation even when it is turned off. The computer takes advantage of a peculiarity of quantum states, so that a result obtained when the computer is off can tell us something about a result obtained when the computer is running. Um, I think I said that right. Well, here’s the thing. The quantum computer is not a machine like we are using now to write this post or read it. When that kind of computer is turned off, it does nothing except occupy space. A quantum computer is much simpler and is designed to operate when a quantum event occurs, like a photon hitting a photodetector. The UIUC team built a rudimentary quantum computer using lasers, mirrors, beam splitters and photodetectors — not exactly an iBook. 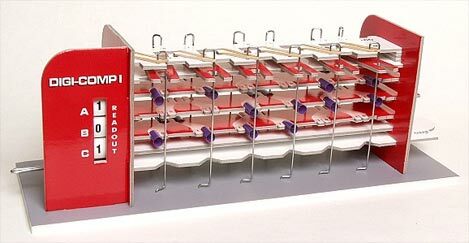 In fact, the concept of the apparatus reminds me of a plastic, mechanical computer I built as a kid in the ’60s. The Digicomp looked really clunky, but it actually worked. The UIUC team used photons to operate (or not operate) the computer. Quantum physics says that really small things (photons, subatomic particles, etc.) can exist as a superposition of two apparently exclusive states, like, say, on or off. This superposition can be treated as a “wavefunction,” a mathematical representation of the simultaneous states. Quantum physics is all about probabilities, so in a way, we can stack the deck (or load the dice) in our favor. That’s essentially what the UIUC team did. For a much more lucid explanation of how this technique works, check out this analogy involving a sleeping puppy and food. The whole concept of wave-particle duality is an analogous situation. Quantum physics requires us to accept that a beam of light or a beam of electrons has both wave and particle natures. Which nature we see depends on the experiment performed. For nearly 100 years, physicists believed light only behaved as a wave, but some experiments could not explained using the wave model. In 1905, Albert Einstein showed it could also act like a beam of particles when it interacts with matter. Neils Bohr’s 1912 model of the atom implied that an electron had to disappear and reappear instantaneously to emit or absorb photons. A decade later, Louis de Broglie predicted moving electrons (particles, mind you) would have wave properties. The Bohr model electrons just changed wavelengths, he said. A couple of years after that, Davisson and Germer observed electron waves when they bounced electrons off a crystalline surface. We now use electrons’ waves properties in electron microscopes to take pictures of really small things. Quantum physics is weird, but it works. Perfecting a quantum computer may create the next, um, quantum leap, in computing power. Sorry, I couldn’t resist. Ziggy made me do it.